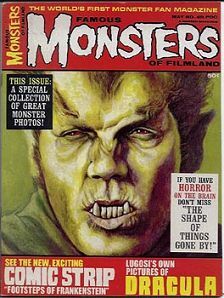 May 1968 issue of FM with cover painting of the Werewolf of London(Henry Hull). Issue features reprint of Dracula article from FM #22. This copy has a slight bend near the spine, otherwise near-mint. Well, after all, most werewolves DO HAVE a slight bend near the spine. Makes 'em run faster. Website design and hosting by Sohodojo Business Services. Item 108 of 466 items displayed in viewer. 0 items in cart.